Vegetarian is not a common word heard in our household. 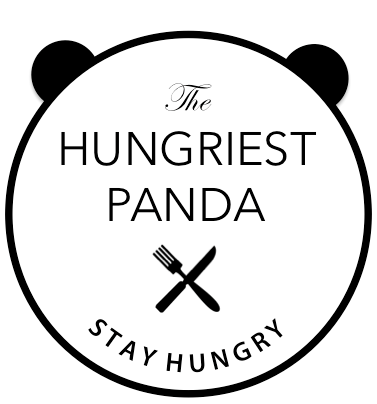 In Shanghai, new restaurants are always popping up everywhere and so our weekends usually consist of going out and indulging in some serious eating. If it’s been an especially hectic week, we’ll crave some greasy comfort food. Most often than not, after dinner will lead to some cocktails with friends and other shenanigans. When Monday rolls around, we reflect on what damage we’ve done to our body from all the eating, drinking and late nights. Weekdays are therefore a good time to detox, and sometimes cooking at home is the best way to do that. 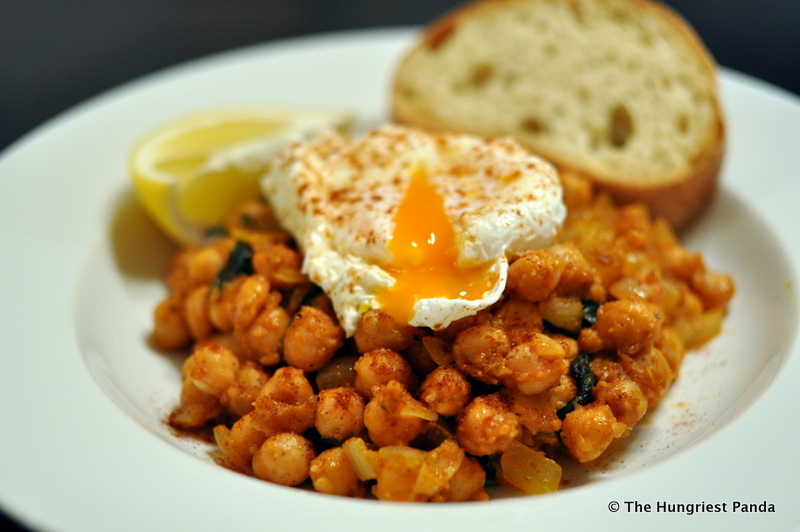 A combination of spinach and chickpeas usually reminds me of an Indian style curry. But with a simple change in spices it can transform into espinacas con garbanzos, a Moroccan dish. Essential Indian spices can be hard to find, so I like that this dish is created from simple and accessible ingredients. It’s also fast to whip up, is hearty and healthy, and makes a great weeknight dinner when you don’t have a lot of time. I doubled this recipe to make leftovers for lunch the next day. The lemon is essential to bringing out the flavors, so don’t skip it. You can substitute with arugula if you can’t find spinach that day. This dish is surprisingly filling and with all the protein you get from the beans and egg you won’t even miss the meat. The colors and warmth of this dish are perfect for fall! 1. Pour half of the oil into a large saucepan over medium heat. Add the chopped onion and saute for 2 minutes, softened but not browned. Add spinach and a pinch of salt. Stir constantly, and cook until the leaves just wilt, about 4 minutes. Drain contents in a colander. Rinse out saucepan and dry with paper towel. 2. Add 1 tablespoon of remaining oil to the saucepan and return it to medium heat. Toss in the bread cubes. Cook, stirring often, until browned all over, about 5 minutes. Add the rest of the olive oil along with the garlic, cumin, and red pepper flakes. Cook, stirring often, until fragrant, about 1 minute (If garlic begins to burn, remove contents from pan immediately). 3. Transfer the bread mixture to a food processor. Pour in the vinegar and process into a paste. 4. Add the paste back to the saucepan along with the tomato sauce and chickpeas. Turn the heat to medium, and cook until the chickpeas have absorbed the flavors, about 5 minutes. Add onion and spinach to the saucepan. Season mixture with salt and pepper. As soon as the chickpeas and spinach are warm, turn off the heat. 5. Add a runny fried sunny side up egg or poached egg on top. Serve with sprinkling paprika, fresh lemon juice and a slice of crusty bread.